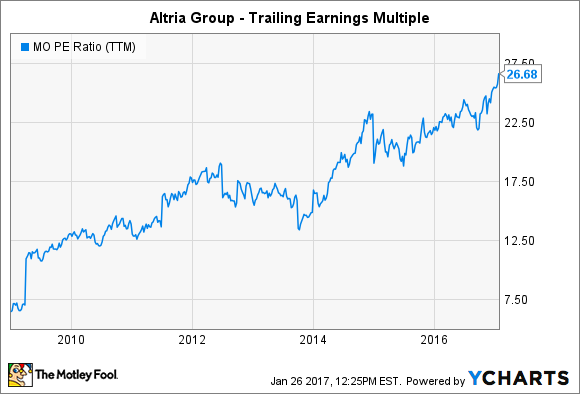 At Record Highs, Is Altria Group Inc. Stock Too Expensive? Earnings multiples have shot up, but does that make the cigarette giant a bad value? Altria Group (NYSE:MO) has produced amazing returns for shareholders over time, but unlike so many high-performing stocks, Altria has rarely earned a high valuation from investors by most standard measures of value. Only recently has Altria stock enjoyed a big rise in its earnings multiples, and that has helped lift the shares to new all-time highs. Yet some worry that Altria's gains have come too quickly and fear that a pullback could be imminent. Below, we'll look at the history of Altria stock in terms of valuation and why current conditions are a lot different from what the company has seen in the past. Throughout much of its history, Altria has had extremely low valuations based on earnings. Single-digit price-to-earnings ratios weren't uncommon as recently as the early to mid-2000s, and the financial crisis in 2008 and 2009 had a downward impact on Altria's earnings multiples as well, albeit on a more temporary basis. Those low earnings multiples reflected considerable uncertainty about the future of Altria's business. During much of its history, Altria faced major threats from litigation that could have destroyed the entire company had a large verdict gone against the cigarette giant. Moreover, regulatory restrictions and the general decline in the number of smokers caused investors to conclude that Altria wasn't just a typical low-growth, high-dividend payer but rather faced a deteriorating business climate that would eventually reduce the company's value to zero. So far, none of those threats has panned out, and the endless pessimism about Altria's prospects has proven to be unwarranted. Having missed out on countless opportunities to invest in the past, investors finally adopted the philosophy that buying Altria shares was reasonable if one expected that the company's strategy of raising prices to offset falling volume would continue to produce ongoing sales and profit growth over the long run. In addition, the fall in interest rates helped make dividend stocks much more attractive. Across the board, stocks that pay high dividend yields have seen their valuations rise dramatically in recent years, because investors seeking income had little choice but to move more heavily into the stock market despite the higher risk involved. MO P/E Ratio (TTM) data by YCharts. As you can see above, the result has been a dramatic expansion in Altria's P/E ratio. Although stocks with trailing multiples in the mid-20s are fairly commonplace when you look across the entire stock market, value investors get nervous when relatively low-growth stocks that are seen as defensive holdings with bond-like characteristics start to get as expensive as they have lately. Is Altria poised for a fall? Altria's current valuation relies on certain assumptions about the future, and any failure on Altria's part to live up to the expectations behind those assumptions could lead to a drop in the stock. For one thing, Altria has remained successful in its ability to adapt pricing practices in order to keep its business profitable and growing. Yet there might be an upper limit to price increases that could tip future growth trends downward. If that happens, investors will be less confident in Altria's ability to keep making enough profit to justify its share price. The more immediate threat comes from rising interest rates. To the extent that investors who've traditionally gravitated toward bonds and other fixed-income investments have bought stocks like Altria in order to keep their income at acceptable levels, a sustained rise in bond rates could lead them to sell off their dividend stock holdings in favor of bonds. If that happens, then investors should expect a broader sell-off in dividend stocks generally, and Altria could well see its earnings multiples contract as a result of reduced buyer demand from income investors. Finally, investors have in mind a certain level of regulation that's likely on Altria's U.S. business. Some of the rise in the stock lately has likely been in response to expectations of a less hostile political environment in the federal government. If a more lax regulatory environment doesn't pan out, then Altria could seem expensive at current levels. For long-term investors, Altria's current valuation is well above what they've seen in the past. That doesn't point to an immediate threat of a huge plunge, but it does make the value proposition that Altria stock presents today far less attractive than it did in the past.